Experience on your iPad the very first, seminal works of Range Murata! 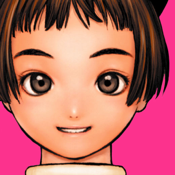 This App combines "LIKE A BALANCE LIFE", the first collection by acclaimed Japanese artist Range Murata, and its paperback version, "LIKE A BALANCE LIFE 0.5". These two books featured the illustrations Range Murata drew for the covers of "Comic Kairakuten", but also sketches, comics and commentaries by the author. And on this iPad edition you can enjoy exclusive features such as "Sketch View" and "Slideshow"! "Sketch View" allows you to see the original rough sketch of each illustration. You can easily access to "Sketch View" by long-tapping each illustration. On "Sketch View", tap on a sketch to display Range Murata's commentary. On landscape mode, the rough sketch and the final illustration will show side by side, for you to compare. With "Slide Show" you can show all the illustrations randomly. You can also choose your favorite song from your playlist as a soundtrack. Artist and designer, born October 2, 1968, in Osaka. Blood Type:AB. Since 1994 he gets noticed for the covers of "Comic Kairakuten" (Wanimagazine) and "Ultra Jump" (Shueisha). In 1996 he starts working as a free-lance designer and releases his first collection, "LIKE A BALANCE LIFE" (Wanimagazine). A multitalented creator, he is renowned both in Japan and abroad for the character design of the fighting game "Power Instinct" (by Atlus) and the animated series "Submarine No.6" and "Last Exile" (both by Gonzo). He is also widely recognized as a product designer and his works include various pieces of furniture and a bicycle.